Laundry is probably a chore you see your parents doing, and maybe you even help by folding or putting away your clean clothes. In 1900, farm houses didn’t have electricity or indoor plumbing, so there were no washing machines or dryers to help do the work. If we didn’t have washing machines or dryers, what do you think we would need to do laundry the same way they did in the year 1900? First, we would need clothes. Think of all the clothes you have at home in your closet and your dresser drawers. Can you believe that in 1900 kids might only have four or five outfits? That’s not even one outfit for every day of the week! Most of their clothes would be for working and doing chores around the farm. They might have one nice outfit to wear for special occasions. What do you think of the clothing in this photo of the Henry Dengler Family in Scott County, Iowa? This family is wearing their special occasion clothing for the picture. Second, we’d need soap. In 1900, they didn’t have laundry detergent like your family uses to clean clothes. They could buy soap at the store, but if they wanted to save money, they would make it at home. The soap they would use was made from two ingredients: lye and lard. Lye is a chemical for cleaning, made from pouring rainwater through wood ashes over and over. It can be very dangerous by itself, so they would have mixed it with lard. Lard is fat from a pig. Mixing the lye with lard would make it safe to touch. Third, we would need water. As we mentioned, Living History Farms’ 1900 era farm house doesn’t have indoor plumbing, so there are no sinks or pipes to provide water. Instead, farmers got water from a pump that brought water up from a well underground. Now we’d wash! The water from the pump was placed in tubs. One of the tubs was called a wash boiler. It was made of special metal called copper. Copper heats up very quickly and a copper boiler could be quickly heated on top of the stove, boiling the clothing and soapy water together. Fourth, we’d need a way to scrub stubborn dirt out of the clothes. After the clothes were boiled in hot water to remove general dirt and stains, they would be scrubbed in another big tub with soap on a washboard. The washboard had metal ridges to help get rid of smaller, set-in stains. After scrubbing, the clothes would be put in a third tub which had bluing in it. Bluing is a blue liquid you put in water which keeps your white clothes white and your colored clothes bright. In the bluing tub, they would also rinse out the last of the soap. Finally, we’d need a way to dry the clothes. After the clothes went in the tub of water and bluing, they were ready to be dried. 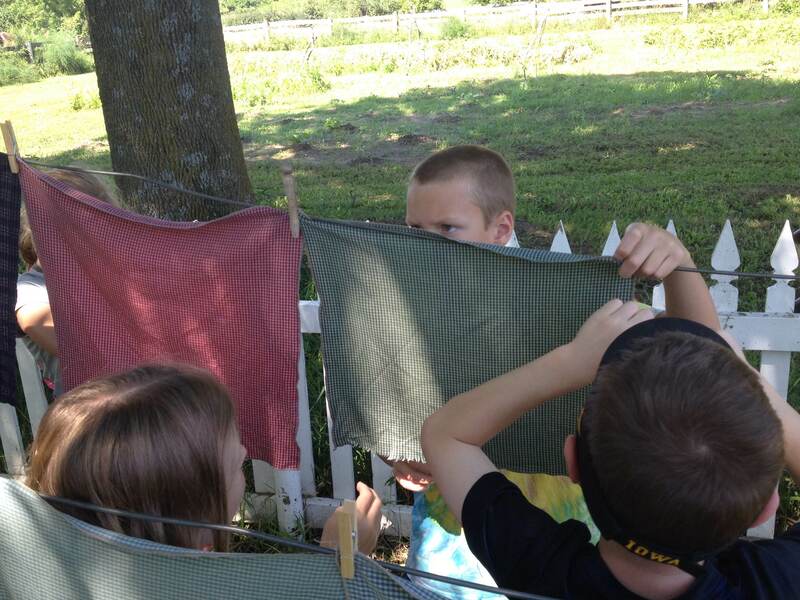 The clothes would be pinned to a wire line outside, so the sun and air could dry them. When they were all dry they were ready to be ironed, then put away to be worn again. Washing clothes was such a big job that it would take a whole day to finish. It was too big of a job for one person, so kids were important helpers. 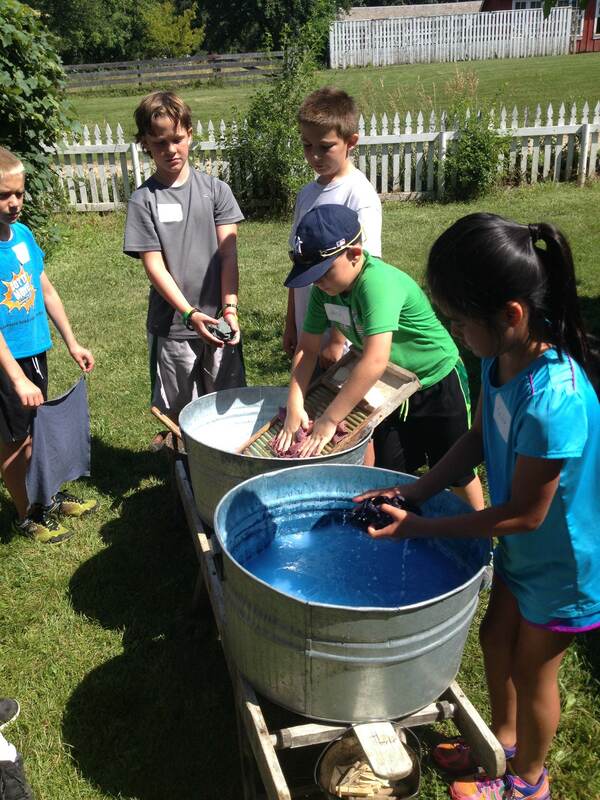 Laundry is done every week at Living History Farms’ 1900 Farm in the summer, so come out and visit and give us a hand!